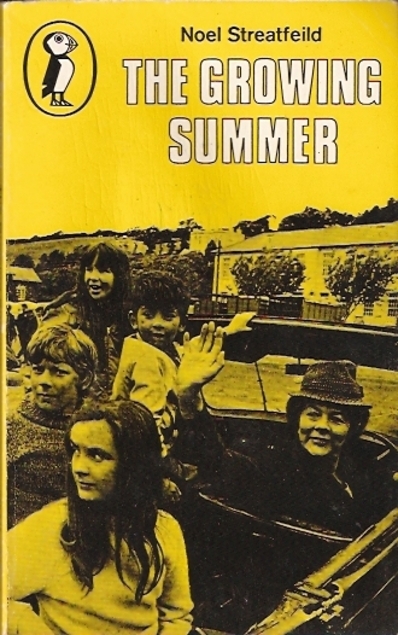 The Growing Summer by Noel Streatfeild was first published in 1966 but my copy is a 1973 Puffin reprint and has illustrations by Edward Ardizonne. It was serialised for children’s TV in the 1970s. If you’re a children’s author the first thing you have to do is get rid of the parents quickly because as we all know parents put a dampener on adventures. In no time flat the four children of the Gareth family are dispatched to Ireland to stay with their Great-Aunt Dymphna. Their father had gone to Australia for a year and had become seriously ill there so their mother went out to join him. Dymphna is a complete stranger to them but they have no other relatives to look after them and Dymphna feels it’s her duty to take them in. They soon discover that she’s very odd, in fact the locals think she’s a bit of a witch. It’s just that Dymphna is really just a wee bit ‘away with the fairies’. She’s steeped in a certain type of children’s literature – Alice in Wonderland, Edward Lear, Kipling, G.K. Chesterton and such and enjoys quoting bits from them. Dymphna’s house is a big ramshackle place full of broken furniture and ornaments, she loves nothing more than a sale of stuff that nobody else wants, but she thinks that by taking the children in she has done her bit, she expects them to look after themselves, wash their own clothes, buy and cook their food – and as their mother had done everything for them at home they were pretty clueless apart from being able to boil eggs. An unexpected visitor that they have to keep quiet about causes them even more problems. I enjoyed this one and wish I had seen the TV serial of it which was made by London Weekend Television in 1968. One of those strange coincidences that crop up amongst readers is that the poem below also featured in the Angela Brazil book (For the Sake of the School) that I read just before reading this one, and I had never come across it before.